Before you begin your villa search learn about staying in a fully staffed Jamaican villa. Most people who visit Jamaica have heard about villas but do not pursue this option because of lack of knowledge. Hotels and the all-inclusive package hotels are advertised extensively and are easy to book. Everyone knows how to check into a hotel and go to restaurants. However the villa, especially the fully staffed Jamaican villa, is relatively unknown. Hopefully the information below will help you understand how this uniquely Jamaican experience is easy to book, and especially to stay in. The following is is a generic description of villa living: please see the specific Villa Guide for the details about each villa. Why would you want to rent a Jamaican villa over staying in an all inclusive hotel? Privacy and Space - Rather than the crowds of all inclusive resorts you have the wonderful privacy and space to relax with your friends or family. All the properties listed by SunVillas are spacious and comfortably or luxuriously furnished. All are located on large beautifully landscaped sites, most overlooking the sea. Most have private pools, bedrooms have private baths and air conditioning or ceiling fans. Don't overlook this privacy factor as a MAJOR contributor to stress reduction. Remember no lines to wait in, no reservations to make at restaurants and NO CROWDS. Personal Attention and a Genuine Local Experience - At the large hotels and all-inclusive the attention you receive from the staff is minimal. All the properties listed by SunVillas are fully staffed with cook, housekeeper, laundress and gardener. The people working here have typically worked in the same property for years and are a large part of the villa experience. Many visitors return to the same villa year after year because of their attachment to the wonderful staff and the attention they receive. 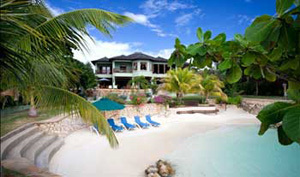 No other Caribbean island, with the exception of small Barbados, has fully staffed villas like those found in Jamaica. 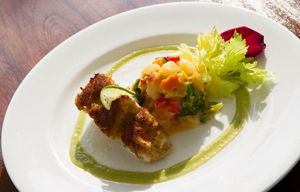 The FOOD - Ask any repeat traveler to Jamaica about where the best restaurant is and most will tell you "the villas". Villa cooks are fantastic. They can whip up a wonderful western omelet or prepare a superb Jamaican specialty such as ackee and saltfish. It's your choice. You can ask that the cook to "surprise" you with her Jamaican cooking skills, or work with her to plan out your meals. Our experience is that the food is so good you don't even want to think about going out to a restaurant! Cost - Imagine all this for less than you would pay to stay at most hotels or an all-inclusive resort. With typical prices ranging from $2,500 to $10,000 a week, and most properties accommodating six to 10 adults, the villa cost per person ranges from $450 to $1,000 per week. Add food, ground transportation, taxes and tips, and the average cost is $750 to $1,500 per person per week. Hard to beat! Our experience is that our van or car packages provides the easiest most convenient way for the villa bound traveler to see Jamaica. Your driver will personally meet you at the Montego Bay Airport. No need to wait in lines for rental cars or the confusion of driving after a long flight. Your party and luggage will be comfortably transported directly to your villa. When you arrive at your villa you will be met by the villa manager (typically the cook) who will have prepared tropical drinks before dinner. She will tour you through the property and allow you to select your rooms and relax before dinner. Food for the first day or two will have been purchased in advance. Food costs average $30-50 per adult per day. The size of the group and menu and liquor choices will affect the cost, so please remember that this is just an estimate. Also please note that some household supplies (such as paper towels, dishwashing soap, Kleenex) will be included in the grocery costs. Dinner will be served by your staff possibly on a terrace overlooking the sea, garden or in a formal indoor dining room. It's your choice! The staff will attend to all details for meals, including shopping, food preparation, set up, serving and cleanup. A villa staff member, typically the cook, will meet with you personally the next day to plan out your menu's, meal times and general villa details. Feel free to ask any questions of any of the staff members. As mentioned an initial supply of food and liquor is purchased in advance and is normally sufficient for two days. Guests are responsible for reimbursing the store which provides the supplies. Your cook will work with you on menus for other meals and will do the shopping. You will need to provide her with money for these purchases. Some guests prefer to shop for the food themselves enjoying the great variety of the Jamaican green markets, or to go with the cook when she shops in the market. Again the choice is yours. Most larger towns have wonderful outdoor produce market open every day. They also have modern, air conditioned supermarkets for other groceries. These stores accepts credit cards and have fully stocked liquor departments selling imported wines, liquors and local liquors and beer (Red Stripe). Local fish, fowl and beef are all available in the grocery store. Also remember the water is safe to drink! How can the staff add you your enjoyment of the villa? The staff are the true joy of a Jamaican villa experience. They are wonderfully accommodating and will try to do anything you want. Just ask. All staff live off the property or in separate accommodations. Our cooks have consistently dazzled us with wonderful Jamaican meals (sometimes we tell her to surprise us!! ), special cakes for birthday or anniversary events, unusual fruits or vegetables that they have grown in their own gardens. Our guests come back truly experiencing a Jamaica that is not available in a hotel or all inclusive. A typical day begins when the cook starts setting out pots of fresh Blue Mountain coffee for the early risers. A full breakfast is served when all the guests are ready. Breakfast will start with plates of fresh Jamaican fruit, such as mangoes, oranges, naseberrys, bananas and fresh squeezed orange juice. It then moves to eggs, pancakes, bacon, cereal; whatever the guest would like. For lunches and dinners, your cook will prepare a mix of Jamaican and international specialties. See our menu suggestions for typical meals. Your housekeeper and laundress will care for every detail of your bedroom and bath. This can include providing fresh linens, towels, flowers, returning your neatly folded laundry and turning down your bed at night. Also available on request are nannies, masseuses and drivers. Everything you could need for a very special and relaxing vacation. No tipping please, until the end of your stay. Typically a tip of 10% (winter season) and 15% (summer season) of the villa rental charge is distributed on the last day. We typically work out the tip distribution based on services performed with the villa manager/cook typically receiving the largest amount. Our Villa Guide on each specific villa will provide the anmes of the staff and suggested tip percentage. A gracious way to handle the tip is to present individual envelopes upon departure. If desired you can pre-pay the gratuity through SunVillas. Our agent in Jamaica, Latoya, will distribute the tips upon your departure. Jamaica is a friendly place to visit. For added security, our villa owners participate in an island-wide security measure in which each of our villas is either staffed at night with a security guard or staff members. In the gated communities like Silver Sands, Tryall and Round Hill the villas will have resort security. You need to take the same care with security that you would in your own home. How do you get back to the airport? Our van or car drivers will drive you back to the Montego Bay Airport on your last day. No need to "turn the car in" at a crowded airport. Typically you should plan 2 hours for the trip from Ocho Rios to Montego Bay and 30 minutes from Montego Bay villas. What additional information will I need after I rent a property? Each villa has specific arrival information that you should print out before your trip. This information is located on each villa web page. Please accept our personal invitation. We look forward to welcoming you to one of our villas in the very near future! In the meantime, please call Alan, Reg, Donna or Latoya anytime for a personalized recommendation: 800-516-4353.